French tip nails are simple, just elegant and classy when done with the white tips. I've been a long time fan of French tips. 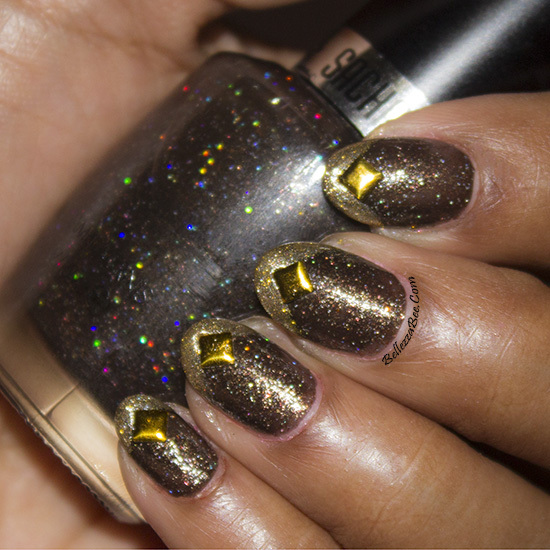 Today's design and nail art challenge puts a twist into this classic by using gold and with a diagonal twist. I'm using two coats of Sacha Cosmetics Cougar Attack nail polish and then hand painted on gold acrylic paint with a fine tip nail art brush. Add a top coat to smooth out the layers of polish and then add a square nail stud to the tips.